Our disposable gloves department features a range of disposable plastic gloves for hand protection for many industries. Most popular for food preparation, in care homes and for cleaning, here you will find a wide variety of disposable plastic gloves for a variety of applications. Browse and you will discover an extensive collection of vinyl disposable gloves. As well as stocking clear and blue vinyl gloves, there are options for your vinyl gloves to be powdered or un-powdered, as well as vinyl gloves for small hands to extra-large! Our disposable plastic glove department also offers latex gloves, which though there are many latex allergy sufferers today, are still a popular choice in professional industries. 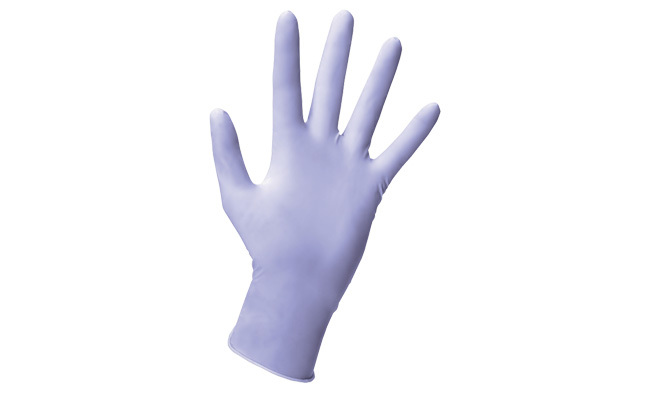 If you or your workers suffer from a latex allergy then our huge range of nitrile disposable gloves are perfect. We stock all the key hand sizes in nitrile gloves as well as a choice of different grades of nitrile disposable gloves. Small synthetic examination gloves designed for medical procedures are available under our Examination Glove section. Here at Pattersons Cleaning Supplies we also stock disposable polythene gloves. These plastic disposable gloves are very popular in the food preparation industry and for food service on delis and cold food counters. Finally our disposable glove department stocks disposable glove dispensers, an essential for holding glove boxes for quick, easy glove dispensing. For all of your disposable glove requirements you need look no further than Pattersons Cleaning Supplies. We only stock quality disposable plastic gloves from brands such as Jangro and Shield who can be trusted to manufacture a disposable glove that performs. You may be able to buy cheaper disposable gloves online, but here at Pattersons Cleaning Supplies we prefer to sell quality plastic gloves and pass the savings on by letting you buy with wholesale pricing. If you have any questions about the range of disposable gloves we stock, please contact our customer services department on 0117 934 1270, or email us on web@pattersons.co.uk.